You have a toothache. A bad toothache. You know you need to get it looked at by a dentist, but yours retired. Or maybe you just moved and don’t know any dentists in the area. Not a problem. You just have to flip open the yellow pages and pick one, right? After all, a dentist is a dentist. Wrong. When choosing a dentist, you want to pick one that’s a good fit for you and this means doing a bit more research than pulling out the phone book. 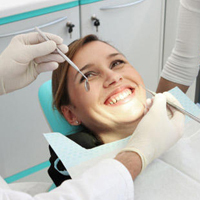 You want to make sure that you’ll be comfortable with your dentist and that they can provide you with the level of care that you need and deserve. The first step to finding the right dentist is to ask around. You could always do a search online of local dentists, but odds are you’re going to find their business web pages, which are there to attract new clients. Instead ask family and friends in the area who they recommend. You should also ask other healthcare professionals, like your pharmacist and doctor. When asking you want to make sure that you get not only the name of the dentist they recommend, but WHY they recommend them. A recommendation based on a low cost and friendly face won’t be of much use to you. Another great resource is a dental school. If there’s one in your area they would definitely be able to give you some great information on local dentists. From the recommendations you got, make a list of the top three or four. Find out where each is located. There isn’t much sense in finding the perfect dentist if they’re located two hours away. Also check to see if the dentist is still in business and if they’re taking on new clients. Once you have this information gathered you should have a list of a few dentists that could be perfect for you. Credentials – Where did they go to school? You want to make sure that it was a reputable institute with the right credentials. How long have they been in practice? – If they’ve been in business for a while, then it usually means that they have a happy clientele. Emergency hours – Is the dentist available after hours and on weekends for emergencies? This can be very important, especially if you have children. You don’t want to get caught on a Sunday trying to find another dentist. Latest procedures – Do they keep up to date on dental procedures and research? Wait time – How long does it take to get an appointment? While you’re having your initial appointment pay attention to the dentist’s personality and demeanor. Is it gentle? Do they seem happy to answer the questions or are you being rushed? Your dentist doesn’t have to have the best personality out there, but you want to make sure that they seem like a generally nice person along with being a top-notch doctor. Shelly Towns is a self-proclaimed health nut who enjoys researching doctors and dentist , cooking, and writing. Shelly Towns is a self-proclaimed health nut who enjoys researching diseases, cooking, and writing.